To celebrate the 100th anniversary of the Falmouth Chamber of Commerce in 2014 the history of Woods Hole’s own businesses from the 19th to the mid 20th century is presented here. Some were members of the Falmouth Board of Trade, the prior businessman’s organization; many were not. Some of these businesses are long forgotten and without photos of them, we often don’t even know where they were located. Scroll over the map for a magnified view. Chas. E. Davis – Wood, Coal, etc. Dexter House – H.M. Dexter, prop. (hotel on Butler’s Point). Hotel Nobska – Later the Corner Inn and then the Hotel Avery. Now the Woods Hole Inn. 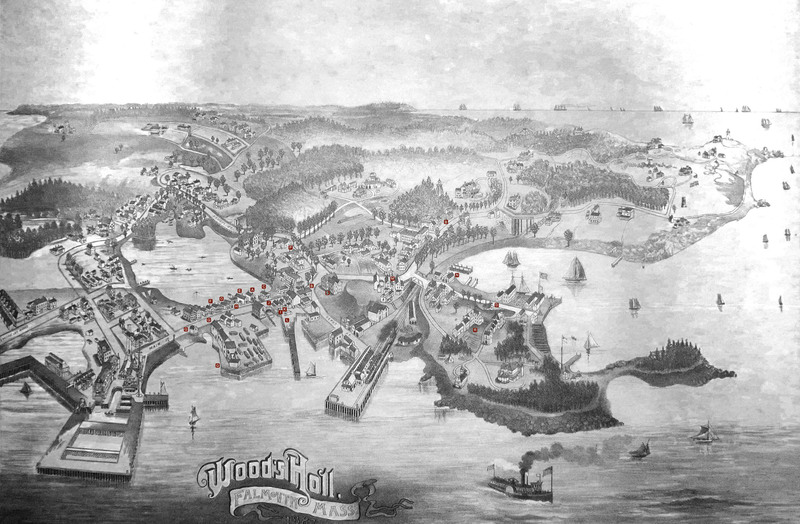 The Woods Hole Inn is the only business that has survived.